Odin’s Ravens’ are ‘thought’ and ‘memory’ http://en.wikipedia.org/wiki/Odin%27s_ravens and he was called ‘raven-god’ on account of his association with them. 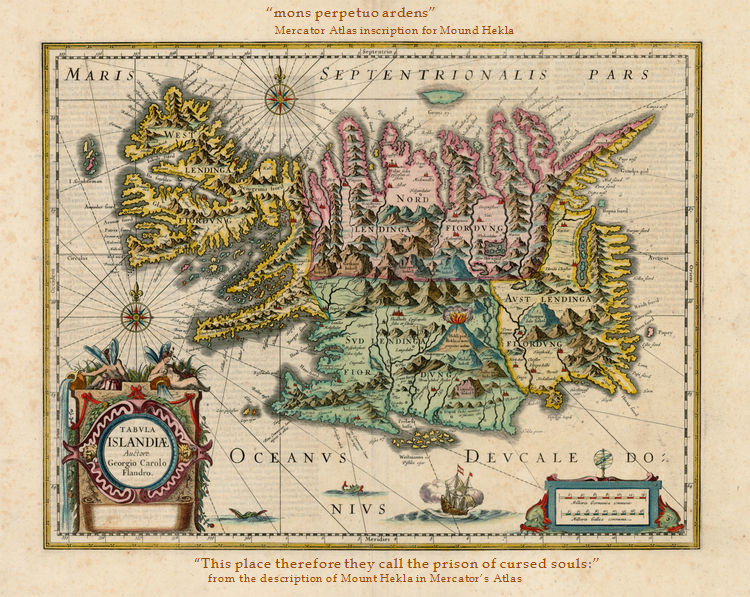 Annette Lassen has established as best as the extant evidence permits it that Hrafnagaldur was written in the years between 1638 and 1668, by someone with close links to Brynjólfur Sveinsson, then Bishop at the See of Skálholt, in Iceland. 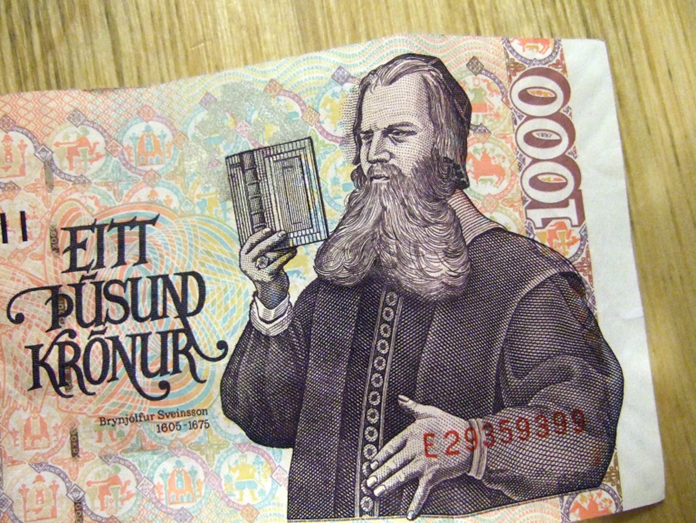 The dating of the poem hinges in the main on two critical events: (i) the arrival in Iceland of the proverb found in stanza 22: “Night is the time for new counsels;” [Lassen, p. 18 – 19], which could only have happened with Brynjólfur Sveinsson’s return to Iceland from Copenhagen to take up the Bishopric; and (ii), a reference in a letter by Árni Magnússon to copies of Hrafnagaldur made by Þorsteinn Eyjólfsson directly from one held by Bishop Brynjólfur. 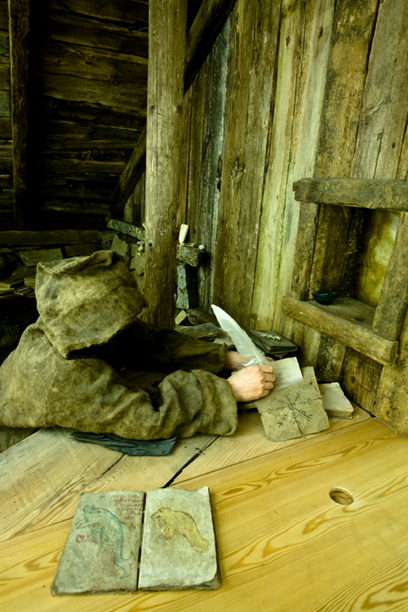 [Lassen, p. 11] Þorsteinn finished his studies at Skálholt in 1668 and did not return there as bailiff until after Bishop Brynjólfur’s death in 1675. 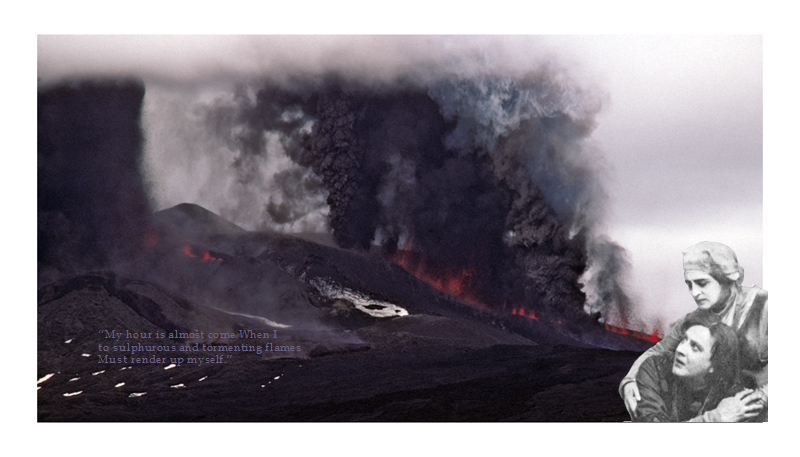 ‘Hekla eruption 2000’ by http://www.trekearth.com/members/mdetay/ ; Russian actors Vasili Kachalov and Olga Knipper as Hamlet and Gertrude in Edward Gordon Craig and Constantin Stanislavski’s production of Hamlet (1911). courtesy wikimedia.org, public domain; the quote is from Hamlet. Within the 17th century home of Hekla, too, there was “was no sharp distinction between the natural and the supernatural environment of the people;” “glaciers and hidden people were equally real.” [Hastrup, p. 268] Spirits, such as the nikur, ‘water horse,’ haunted Iceland’s lakes and rivers [ibid, 249 – 250]. “No clear boundary was drawn between fish and other sea-beings.” [Hastrup, p. 253] Elves, ‘the hidden people’ [ibid, p. 262], peeked out from knolls and rocks in the immediate vicinity of the farmsteads; trolls hid out in the rocks and mountains, sharing the thoroughly wild spaces with ‘out-lying men’ [ibid, p. 264]; that is to say, outlaws and other people who had chosen for one reason or another to live apart from other people. The next the world was to hear of the matter was in 1643, when that collection of writings alleged at the time to be Sæmundur’s somehow came into the hands of the Lutheran Bishop at Skálholt, Brynjólfur Sveinsson, in 1643. Bishop Brynjólfur believed his find had been written by the priest Sæmundur and so it was termed Sæmundar Edda for centuries, until modern scholarship determined that no part of it could have been written by the “larger-than-life” priest. Völuspá has everything to do with Hrafnagaldur Odins. For starters, the final stanza of Hrafnagaldur clearly picks up where Völuspá leaves off, in terms of overall context. Völuspá is the response of a [dead?] seeress to Odin, Norse god of battles, magic and Valhalla, where those who died in battle get to go, when he consults her regarding the ultimate fate of gods, humans and everyone else in the medieval Norse cosmogony. That fate, Ragnarök, is pending in Völuspá but not imminent, whereas the final scene in Hrafnagaldur is the prelude to Ragnarök, which is now imminent. (iii) The answer to the question of why ‘Iðunn’ in the poem failed to answer Heimdall’s questions. 1. That Hrafnagaldur was written by the sorcerer Jón lærði ‘the learned’ Guðmundsson (c. 1574 – 1658), after his second conviction for sorcery in 1637 and subsequent exile to the East Fiords in Iceland. 2. That Hrafnagaldur, which has the subtitle ’Forspjallsljóð,’ ‘foretelling,’ in every copy of it [Lassen, p. 22], is itself a preface – to the Eddic poem Völuspá – right up to the very last stanza, which then closes the Eddic poem. We can easily see this relationship, if we consider the significance of the respective contents of the two poems, in connection with Idunn’s refusal to answer “the scion of gods and his companions” in Hrafnagaldur’s stanza 12. What will signal the start of Ragnarök, according to Völuspá? It will be Heimdall’s act of sounding his horn: “fate’s measure is lit at the clarion call of Gjallarhorn” [Stanza 45/46]. He doesn’t actually do this in Völuspá. 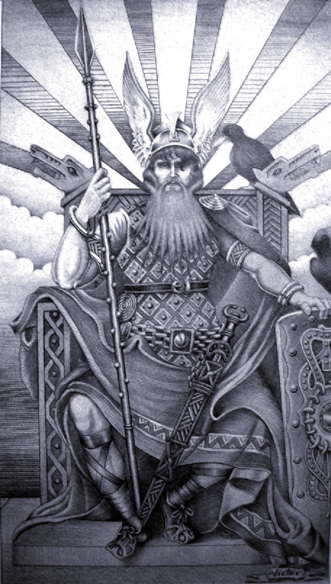 On the contrary, it’s clear to me that the prophecy in Völuspá compasses a supernaturally large ‘Present Moment,’ containing what for us humans would normally be experienced as ‘past,’ ‘present’ and ‘what will be.’ The start of Ragnarök is clearly no more present by the end of Völuspá than Odinn’s death in it is, or the prophesied subsequent ‘dawn of a new age,’ in my opinion. The poem Hrafnagaldur, by contrast, explicitly ends with Heimdall’s actual act of taking up his horn – the unmistakeable herald of the start of Ragnarök. As soon as we answer the question “why didn’t Iðunn answer Heimdall?” with the response, based on knowledge of Snorri’s Edda, “because of Loki,” then an elegant and meaningful relationship in space and time between the Eddic poem and the 17th century one glides into view. I suggest that Hrafnagaldur was intended by its 17th century author, the sorcerer Jón lærði ‘the learned’ Guðmundsson, to be itself a kind of preface to Völuspá, with which Jón lærði was well familiar, via Snorri Sturluson’s Prose Edda. [Faulkes [I], p. 103] As a preface, Hrafnagaldur Odins addresses the question: ‘Just how was contact made by Odin with a clearly non-human seeress?’ In other words, it is, I maintain, an elliptical 17th century Icelandic lesson in the banned art of seiðr, i.e. ‘sitting out’ (at night) to commune with ‘the hidden folk’ for the purposes of magic-working or divination. And then, Völuspá kicks in. Now Odin personally pays a visit to another seeress. From her, he learns the reason why the seeress, Iðunn,* of Hrafnagaldur was either unable or unwilling to answer Heimdall’s questions. Loki. Loki had been standing right there with Heimdall; and Iðunn, from her position in what must be either the underworld of the dead or that of the giants, had learned that Loki would betray the gods. * For, as such, Heimdall and his companions had hoped she would prove to be on that journey. It’s clear that right up until the end of Hrafnagaldur, the gods are unaware of the role Loki will play in Ragnarök. He is welcomed back into Odin’s hall together with Heimdall and Bragi. The goddesses question him over dinner about the trip down below to see their lost Iðunn. And yet, the very end of Hrafnagaldur is clearly the beginning of Ragnarök – when Loki will lead the forces in war against the gods; because the last stanza explicitly states that Heimdall took up his horn – which, according to Völuspá, is the signal for the gods that Ragnarök has begun. 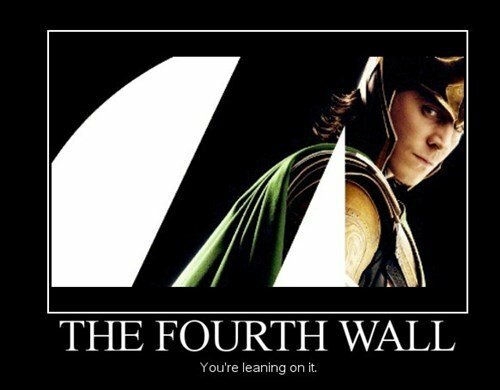 So, when, then, did the gods learn about the role Loki would play? It must have been after that feast in Hrafnagaldur, and before the final verse, wherein Heimdall took up his horn to sound the start of Ragnarök. “Night is the time for new counsels.” (Hrafnagaldur, stanza 22) It’s also the time when sorcerers sat out to commune with spirits, including those of the dead. And Völuspá is clearly such an act of seiðr, or ‘sitting out in séance:’ “Alone she sat out, when the old man came, terror’s son of the Æsir, and looked into her eyes. “What are you asking me? Why are you testing me?” (Stanza 28) http://www.voluspa.org/voluspa.htm Völuspá concludes with the ending of the séance, and, perhaps, with the sinking of the clearly unfriendly, and evidently non-human seeress, and not with the actual start of battle. Not only was the sorcerer Jón lærði very well acquainted with Snorri’s Edda [Faulkes [I], he was also notable for his frequent use of unusual words in his writings [Faulkes, [I], p. 105]. Annette Lassen has established that one of the key identifying markers in Hrafnagaldur is its use in stanza 22, as “a high point in the poem,” of what appears to be a Latin proverb [Lassen, p. 20]. Jón lærði evidently did not know Latin and therefore could not have read the proverb in what was likely to have been the sole source for it at that time, namely Bishop Brynjólfur’s copy of Erasmus’s Adagia. [Lassen, p. 20] However, the Bishop had begun commissioning the sorcerer to do manuscript illustrations for him by 1641, and, by 1644, the Bishop and the sorcerer were tight: http://www.visindavefur.is/svar.php?id=6790 …. It doesn’t take a want of scepticism to think the Bishop might well have quoted the proverb at some point to his new scribe. The Latin proverb is hardly a stumbling block to a non-speaker of Latin having written it into the poem. The first verse in Hrafnagaldur suggests that the poem has an esoteric meaning: the powers ascribed in the stanza to supernatural beings are also powers possessed by human souls. On the surface of it, though, stanza 1 sets out classes of beings and behaviors by which those beings may be recognized. Stanzas two through four tell us of a problem, for the solution of which, those powers listed in stanza one will be required; logic and inspiration have failed to resolve the situation; and the need to do so is critical, because the situation is worsening. 1. That Vp 3/7 [gap var ginnunga] is based on a reversal of the two components in the mythical place-name Ginnungagap, without influence of other origin: i.e. ginnunga had no meaning or usage in ON that was not ultimately dependent on the place-name [‘gap, ‘opening’ a place-name element in Norway but not in Iceland though vb. ‘gapa’ to gape with open mouth’ is common] (which may have made it easier to reverse). To my mind, the whole of Stanza 4 suggests a massive shift in consciousness. With respect to the poem’s overt discussion of an intensified problem, however, the glimmer of where a solution might profitably be sought appears in Stanza 5: “Stand no longer shall earth or sun. The stream of air with corruption laden shall not cease. Hidden is in Mim’s limpid well men’s certain knowledge. Understand ye yet, or what?” [Thorpe] The stanza, however, refers to “men” not gods in connection with “certain knowledge.” And then it asks, “do you understand?’ The question spins the thrice-repeated refrain in Völuspá: “do you know yet or what?” underscoring the critical difference between knowing something and understanding it (i.e. being able to use that knowledge). Idun was a goddess in heathen times, strongly associated with the gods’ power of self-renewal. I stated in my other page on Hrafnagaldur that, on a metaphysical level, this would mean Idun represents the power of religious faith. It is faith that keeps a religion alive. However, while that is also true in Hrafnagaldur, there is something more, therein, to the use of Idunn as a motif. Hrafnagaldur goes on in its stanzas 7 and 8 to describe a fall that is more reminiscent of a Biblical Eve than of anything known about Idun from Old Norse sources. One can see how the man who was perhaps most renowned in his own time for his “successful driving away of a ‘Turkish’ slave-raider ship, where his only weapons were the words” [Hastrup, p. 202] might have been feeling just a tad bitter about his banishment. 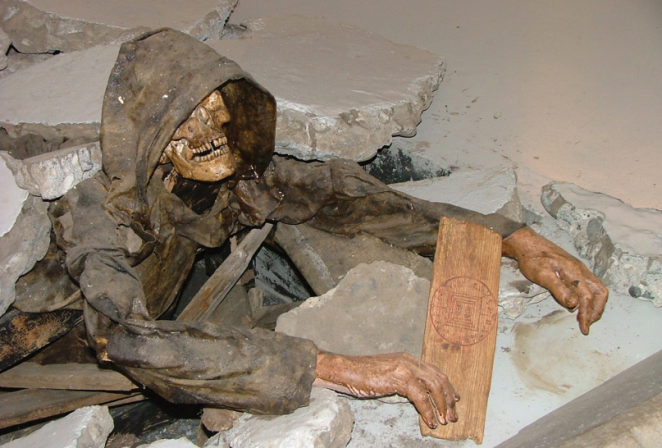 A representation of Jon ‘the learned’ in the Museum of Icelandic Sorcery & Witchcraft, courtesy of http://www.galdrasyning.is/press/ ; Photographer: Sigurður Atlason , who has a youtube channel with video tours of the museum and environs: http://www.youtube.com/playlist?list=PLDD8C478E4F5CDAAB Interesting guy…. Bifröst´s guardian is Heimdall, of whom Snorri says in Gylfaginning: “There is one called Heimdallr. He is known as the white Áss. He is great and holy. 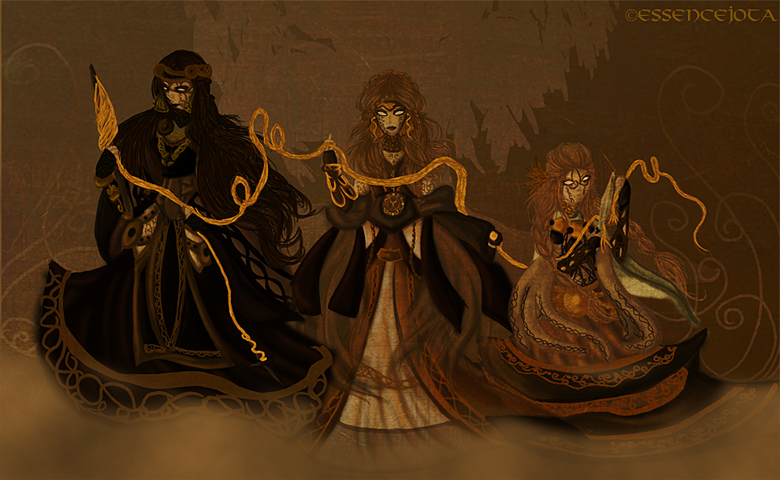 Nine maidens bore him as their son, all of them sisters. He is also called Hjálmskíði and Gullintanni. His teeth were of gold. His horse is called Gulltoppr. He lives in a place called Himinbjǫrg by Bifrǫst. He is the gods’ watchman and sits there at the end of the world to guard the bridge against mountain giants. He needs less sleep than a bird. He can see, just as well by night as by day, a distance of a hundred leagues. He can also hear grass growing on the earth and wool on sheep and everything that makes a sound. He has a trumpet called Gjallarhorn and its blast can be heard in all worlds. So it says: There is a place called Himinbjǫrg, and there Heimdallr dwells, they say he controls the guardianship for the holy places of the gods. He drinks in the pleasant hall, merry, the good mead. Jórunn is yet another epithet for Idunn. Heimdall is the subject of the first line of the stanza; ‘Nál’s nephew’ refers to Loki; and ‘the poet of Grimnir’ is the god Bragi. Vingolf is one of the halls of the gods. Forniot’s kin = the winds. [But see also the remarks concerning stanza 17 on my page ‘Hrafnagaldur Odins, (Odin’s Raven Magic-Song] Ygg. ‘the terrible one.’ One of Odin’s names. Here it becomes explicit that the goal of the visit to Idunn was connected with seidhr and wisdom obtainable therefrom. Hrafnagaldur’s stanza 22 suggests to me that Jón lærði Guðmundsson may well have been tipping off Bishop Brynjólfur Sveinsson as to who had written this poem – and for whom, namely, Jón lærði’s best friend in the world, possibly his only friend after his banishment, the person who valued his voice and ideas, gave him a new purpose, and enabled his continued survival. As we have seen in the historical overview, the 17th century saw Iceland along with the rest of Northern Europe preoccupied with the question of what happened to dead people, and the Bishop was probably just as concerned as any, on both a theological as well as a personal level. Árgjõll. apparently a variant-name for Heimdall’s horn. Úlfrún’s descendant. Heimdall. Gardela, Leszek, ‘Into Viking Minds: Reinterpreting the Staffs of Sorcery and Unravelling Seiðr,’ 2008 paper pub. in Viking and Medieval Scandinavia 4, 45-84.